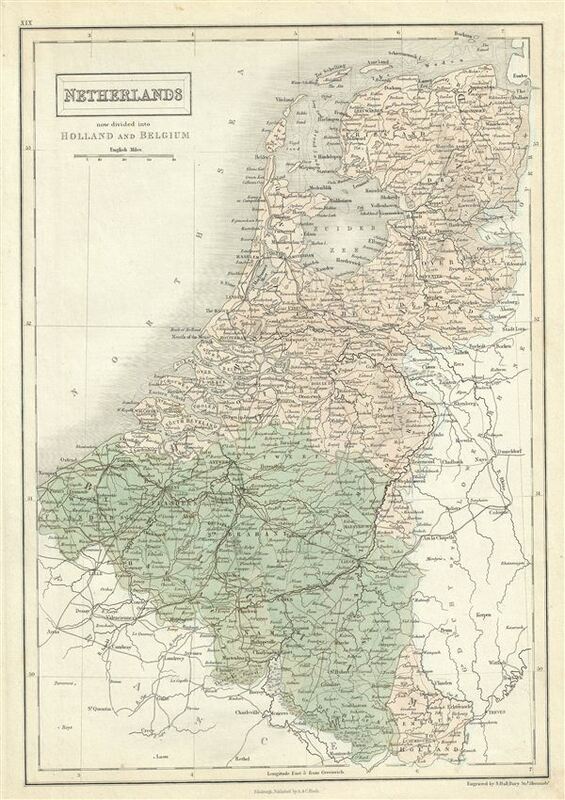 This is a fine example of Adam and Charles Black's 1851 map of the Netherlands, now divided into Holland and Belgium. The map covers both Holland and Belgium from Friesland to Luxembourg. The Grande Thierache or the 'Thierache Forest' in southern Belgium and 'The Peel' in southeast Holland are beautifully rendered. In 1830, the Belgian Revolution led to the secession of Belgium from the United Kingdom of Netherlands and it's subsequently consolidation as the independent Kingdom of Belgium. Though Belgium had successfully attained self-rule, the Netherlands refused to recognize the new country until the 1839 Treaty of London. Throughout, the map identifies various cities, towns, rivers, lakes, roadways, railways, islands and an assortment of additional topographical details. This map was engraved by Sidney Hall and issued as plate no. XIX for the 1851 edition of Black's General Atlas of the World.